I am preparing for NUOVA by studying the score and listening to a number of recordings. I am familiarizing myself with Purcell’s style and his development of Baroque music. I am exploring different options for ornamentation and interpretation of the music and text. What attracts you to NUOVA’s program? Why this year? Having attended NUOVA before, I am familiar with the exceptional training. The high caliber of teaching at Opera NUOVA is done in a supportive, encouraging and constructive learning environment. This year, I was particularly interested in joining NUOVA, as I hope to expand my knowledge of Baroque opera and evolve a personal style that I can incorporate into all Baroque repertoire. In addition, the program delivers top quality instruction and the performance opportunities allow you to implement these skills into practice. Praised as a “sophisticated artist” with a “gorgeous voice” and “stratospheric vocals” (Winnipeg Free Press), soprano Katherine Mayba is an exciting artist in the opera scene. A native of Winnipeg, Manitoba, she has performed with Manitoba Underground Opera as Ilia (Idomeneo) and Amore (L’incoronazione di Poppea), Manitoba Opera (Don Giovanni, Falstaff, Madama Butterfly) and has made regular appearances with Flipside Opera. She has also performed as a soloist with the WSO and through the Orville J. Derraugh Scholarship Competition, and has competed in the Winnipeg Music Festival winning several awards including the Rose Bowl. 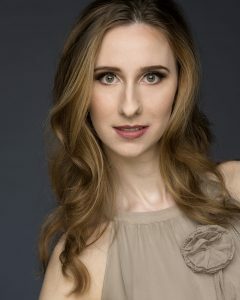 This season she joined the WSO on their Holiday Tour and will appear as Titania (The Fairy Queen), Queen of the Night (The Magic Flute) and the Ukrainian Art Song Project. Katherine studies at the University of Manitoba and is a student of Tracy Dahl. A multidisciplinary musician, she holds her ARCT Performance Diploma in Voice, Piano and Violin from The Royal Conservatory of Music.